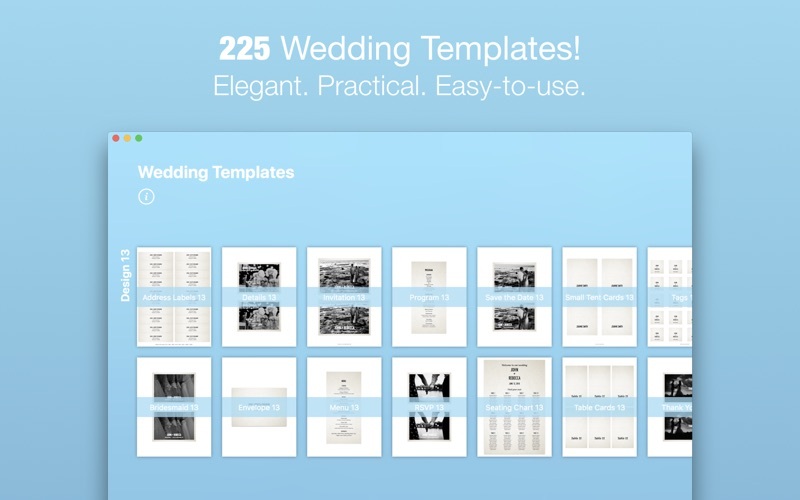 225 WEDDING TEMPLATES FOR PAGES Wedding Templates (by Nobody) is an amazing add-on for Apple’s Pages app. It provides 15 different designs with 15 templates per design. 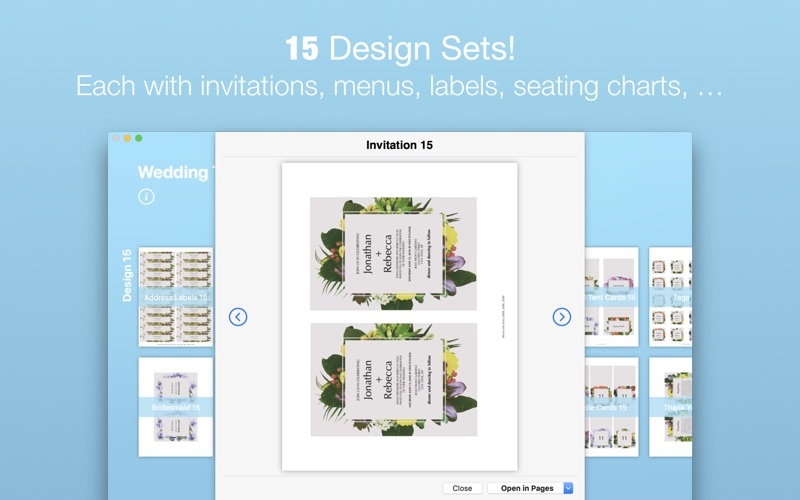 15 TEMPLATES PER DESIGN 1.Address labels 2.Bridesmaid Cards 3.Details Cards 4.Envelope (2 sizes) 5.Invitation 6.Menu 7.Program 8.RSVP 9.Save the Date 10.Seating Chart (3 sizes) 11.Small Tent Cards 12.Table Cards 13.Tags 14.Thank You Cards 15.Wraparound Labels AVERY SUPPORT Address Labels: 5161, 5261, 5961, 8161, 8461, 5661, 18661, 15661 Invitations: 5889, 8386, 8389 Small Tent Cards: 5302 Tags: 22849 Wrap Around Labels: 22929 DIFFERENT PAPER SIZES All templates are available in US Letter and A4, except for the Envelopes (5.13x3.63 in and 6.25x4.25 in) and the Seating Charts (20x30, 24x36 and 30x40). 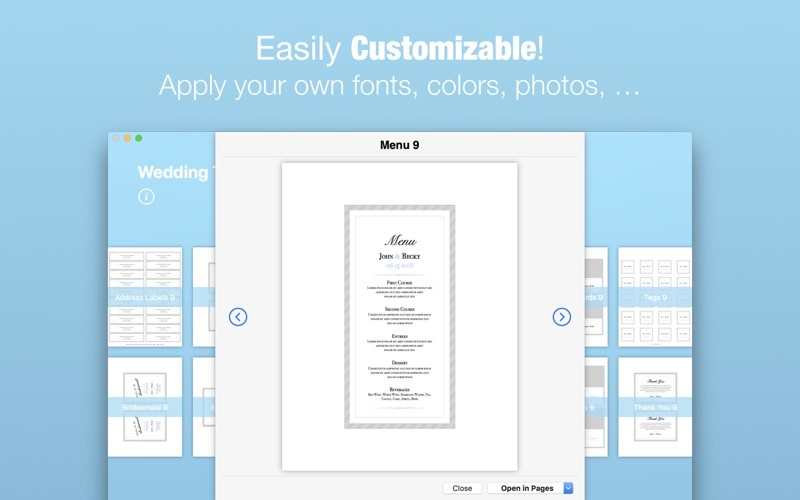 EASILY CUSTOMIZABLE Once opened in Pages you can apply your own colors, fonts, pictures, etc. 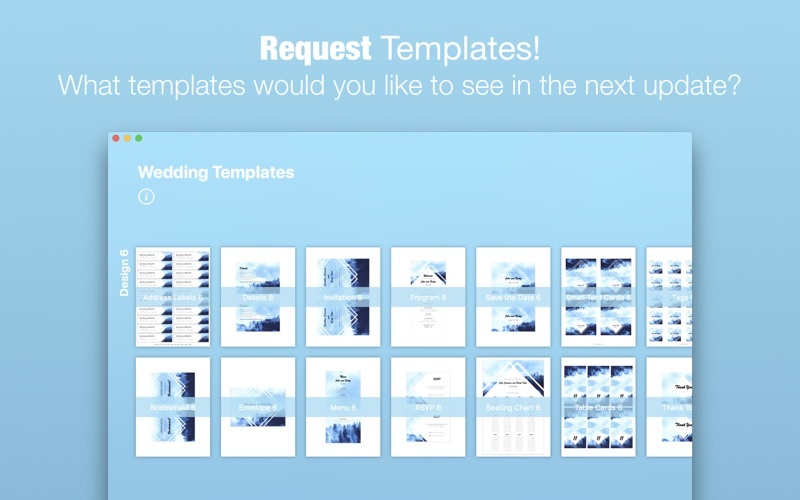 REQUEST TEMPLATES Tell us what templates you would like to see in the next update. IMPORTANT: PAGES REQUIRED!!!! Make sure you have Pages - Apple’s word processor. In order to open any of the templates, you need to have Pages installed on your device. 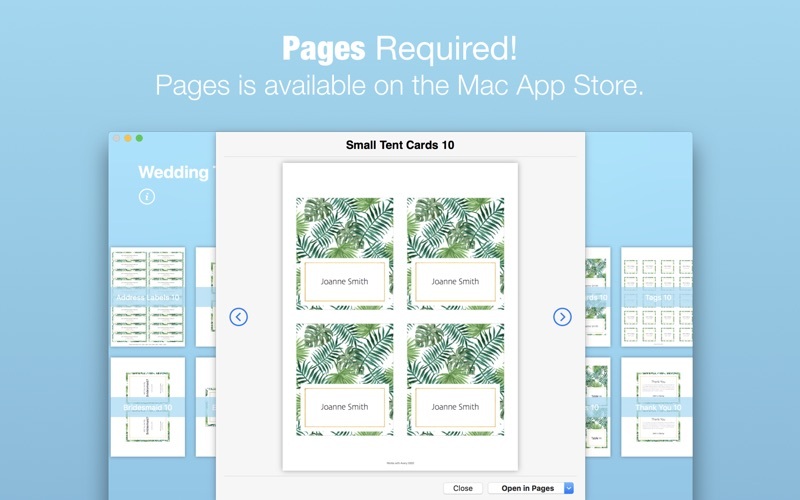 You can download Pages from the Mac App Store. The only reason why you would be able to open a template is if you did not have Pages installed on your device! ***Pages version 5.3 or higher required.